Bass is a rural village situated where the Bass Highway crosses the Bass River, about five km in from the eastern shore of Western Port Bay. It is a place of considerable historical importance. In 1797 George Bass explored and named Western Port Bay. He noted that fresh water was obtainable from the creek on the eastern side, ie Bass River, and named the eastern cape of Phillip Island Wollamai. Three years later Lieutenant James Grant explored Bass Strait and used Bass' freshwater creek to replenish his supplies. In 1835 the well known Batman and Fawkner parties from Tasmania began the permanent settlement of Port Phillip, and in September 1835, Samuel Anderson of Launceston crossed Bass Strait and took up settlement at Bass River, close to the place where Bass and Grant obtained their freshwater supplies. Anderson was joined by two brothers and all farmed and retired in the district. Samuel Anderson's homestead became the place for surveying a village in 1863. It was named Woolamai, and kept that name until 1896 when it was changed to Bass. Prior to then there had been a place named Bass Landing downstream, but it fell into disuse when rail and road transport overtook shipping in Western Port Bay. Local farmers more successfully organised an annual agricultural show (1884-97), and the showground subsequently became a saleyard until the 1950s. 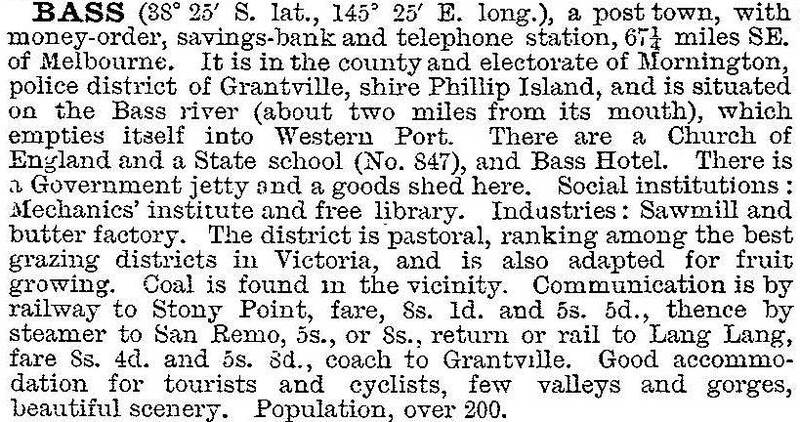 Civic amenities built in Bass included an Anglican church (1878), a Catholic church (1905) and a hall (1897). A replacement hall was built in 1956. Bass has a general store, a hotel, a community centre, and a recreation reserve. The Wildlife Wonderland with the Gippsland giant earthworm museum closed in 2012. At the 2011 census dairy farming accounted for 3.8% of employment and other farming 8%. Bass was identified in 2011 as one of the localities in Victoria which future rising sea levels could inundate.